Zirconium Implants – is a safe and effective way to restore missing teeth in a cosmetic zone by bio-compatible ( completely tissue-friendly ) material. There are no allergic reactions, no sensitivity to temperature and no impact on taste. Metal-free Zirconium dental implants are increasing in popularity for a variety of reasons. These implants are known to interact well with the bone and gums, and they are a good holistic option for patients who want an implant that will support their overall health. Many people are choosing Zirconium implants over the traditional titanium varieties, and there are several reasons that the trend in dental implants is moving in this direction. Titanium implants sometimes result in aesthetic issues. This is especially true for patients who experience gum recession or those who have thin gums. When titanium dental implants are put into place, the gums can appear gray. Zirconium is white and not a metal, so it can provide for a more natural look. 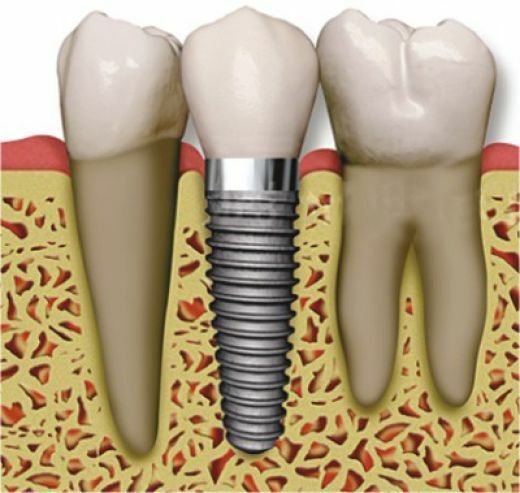 The traditional titanium dental implants consist of two metal pieces that are joined together using a fixation screw. When put under extreme pressure, these two pieces can move slightly, and this may result in pockets in which bacteria can colonize. Zirconium dental implants are made from a simple, one-piece design to eliminate this problem. These ceramic components will not shift after implantation, so infection is less of a concern. Metal implants can be a big problem for people who have allergies. In some cases, sensitivity may not even show up until years after the implants have been put into place. This can result in bone loss and implant failure. Zirconium dental implants are hypoallergenic, so sensitivity and allergy issues are not a problem. Zirconium dental implants are extremely strong and durable, and their long-term success is one of the most attractive features of the system. These dental implants were designed to withstand great force, and they are known for their superior strength and inflexibility when put under pressure. These are great qualities for a dental implant system to possess. Many patients who choose metal-free Zirconium dental implants claim that they enjoyed a shorter implant process and greater comfort with their system. The strength of Zirconia also allows for greater function after the surgery, so the odds of having long-term success with these dental implants are quite high. Titanium dental implants are known to corrode when placed into a wet environment like a mouth, and this process is accelerated if other metal is present in the teeth. When fluoride is added, metal corrosion also speeds up and can attack the implant surface. With Zirconia, which is a biocompatible material, these concerns are less of an issue, as the substance is resistant to corrosion, and it also doesn’t trigger chemical reactions or conduct heat and electricity. Metal-free Zirconium dental implants are designed so that they can be placed immediately following a tooth extraction. This one-stage surgery reduces the amount of time it takes to place the implant in order to maximize the comfort of the patient. A less invasive surgery also results in shorter recovery time and less pain during in the days to follow the procedure.